Overdrive is an ability of Metal Extractors that allows them to drain energy to multiply their metal income. It uses a grid mechanic that is also required by some powerful defense structures to function. Circles around metal extractors and energy sources show their grid influence. Structures are in the same grid if their circles overlap. The unused energy income in a grid is sent to the connected Metal Extractors to multiply their income. Grids between allies can be connected. The more energy a Metal Extractor uses, the less efficient it will be. Some weapons (Lucifer, Desolator, Cerberus) need a certain level of grid energy to function. If a grid is pink or violet - Make sure you have some excess energy and connect Metal Extractors and energy structures together. If a grid is light blue or green - Keep adding energy. If a grid is yellow or red - The grid is inefficient. Spread out the energy by expanding the grid to connect more Metal Extractors. The energy grid consists of your energy structures, pylons, and mexes. Each Mex and energy structure has an effect field; two structures are linked if their effect fields overlap. Linking econ structures together creates a grid; the energy produced in the grid is the maximum energy that can be used to overdrive all the mexes in the grid. A team with full energy storage spends all of its excess energy on overdrive. Overdrive always costs energy, and does not occur if a teams expenditure exceeds its income income. All the available energy is spent provided that there are sufficient grid connections. The total energy used by the metal extractors of a grid can never exceed the overdrive capacity of a grid. The total overdrive capacity of a grid is the summed energy income of each structure in that grid. For example, a mex with 2.2 base income and 4 overdrive energy generates 2.2*(sqrt(4)/4) = 1.1 overdrive metal. Selecting an economy structure will show the effect fields of all econ structures. The color of the field denotes its efficiency: runs from purple to red as it becomes increasingly inefficient; pink means unlinked. If a structure is disabled for any reason (EMP, for instance), it loses its pylon functionality; the field turns grey to indicate this. The overdrive equation has diminishing returns. It takes 16 energy initially to double the income of a mex, and a further 64 energy (80 in total) to increase the output to triple its income. As a result, your metal to energy conversion ratio improves as more mexes are built and added to the grid. For example, compare four +2 mexes in a grid to a single +2 mex, each in grids that have been allocated 16 energy. Each mex in the 4-mex grid receives 4 energy, which overdrives them each by 50%. Therefore the mexes each generate +1 overdrive metal, for a total of +4. The single mex receives 16 energy so is overdriven 100%, resulting in +2 overdrive metal. Spreading your overdrive, and thus your grid, between many metal extractors improves the efficiency of your overdrive. In practice only about half of your extractors need to be linked to an overdrive grid for most games. The cost and risk of linking extra extractors can be too great for the minimal gain of linking an already efficient grid. It can be advantageous to construct a few small energy structures next to many of your mexes to take advantage of the highly efficient low levels of overdrive. Overdrive works by multiply base income, so metal spots with unusually high incomes are particularly important to overdrive. Such mexal spots can be found in the center of many maps, which makes the task of overdriving them safely quite difficult. The overdrive equation has been solved to optimally distribute energy to the mexes that will yield the greatest income, so you never need to worry about connecting mexes with varying incomes to your grids. Try to capture metal spots with high incomes and overdrive them as much as possible. These extractors will max their grid sooner than others so make sure to keep track of their energy usage. This shows the state of a single extractor. X is the base metal income of the extractor. Y% is the extra metal income from overdrive. Z is the energy used by this extractor to produce the extra Y% of income. This shows the behaviour of the energy grid that the structure is part of. X shows the total extra metal produced due to overdrive in this grid. Y shows the total energy expended to produce this metal. Z shows the energy production of all the energy structures of the grid, Z is the upper bound of Y. Some defense structures also require a connection to a grid in order to function (e.g. Cerberus, Desolator, Lucifer). The grid must have a minimum power output; however, any number of structures can use the same grid. 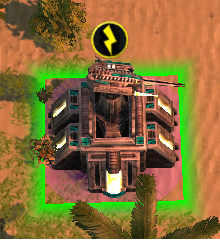 If a defense structure is not connected to a sufficiently powerful grid, an energy icon will display over it. This page was last modified on 17 April 2019, at 15:44.